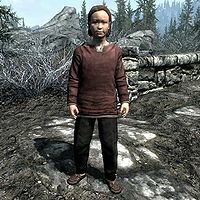 Virkmund is a Nord child who lives in Morthal with his father, Thonnir. He's waiting for his mother to return home someday, even though his father tells him not to. Virkmund wears child's clothes and a pair of shoes, and carries a key to his father's house. Virkmund wakes up at 8am and heads out to seek his friend Agni. After playing for 2 hours he visits Lami in the Thaumaturgist's Hut for 6 hours before heading back home, where he remains until his bedtime at 9pm. Obviously concerned about the whereabouts of his mother, Virkmund will be quick to ask you if you have seen her: "Have you seen my mother? I'm still waiting for her to come home." He will then tell you about some advice his father gave him: "Papa says that I shouldn't keep waiting. Why not? Mama has to come home some time." He may also ask you about the Stormcloaks: "Who are the Stormcloaks, and why would mama want to spend time with them instead of me?" He is referred to as Stofleid by game data. Despite his mother being a Breton, Virkmund is a Nord.